Hi. My name is Gracie and I am 6 years young. My Mom wanted me to write this for GALT since she felt it would be best described from a GREYT prospective. My Mom adopted me in February of 2009. 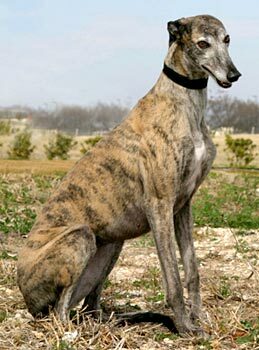 She told me she always loved the regal stance and peaceful demeanor of the greyhounds she had met. Unfortunately Mom had to say goodbye to two previous hounds (Basenji's) at the same time due to age and illness. It broke her heart and she was so very sad. They were rescues too. 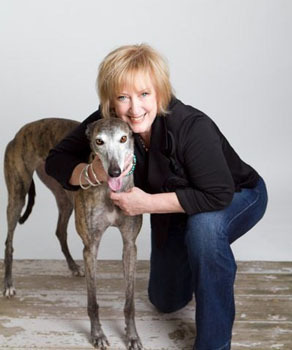 While her heart healed she began to consider fulfilling her dream of having a greyhound. She searched greyhound rescue groups for hours every night and decided to look seriously at GALT. She read lots and lots of athlete ads and looked at the pictures to consider a happy match on paper and in the soul of a greyhound. My Mom first picked me to go visit at my Foster Mommy's house, Lisa B. She even cut out my pictures and taped them up to look at every day until we met. She wanted to be sure she could make me happy and we would be a good match. It was love at first sight. She took me home, let me keep my name of Gracie and stayed in touch with the Foster Mommy so she would know everything was good. Foster Mommy even came and had a visit! I showed her all my new toys, my couch, my doggie beds, etc. I have even been to a Rehab/Nursing Home to visit the patients there. They loved me and after about two hours, I had to go home and take a nap. I love people so much and never meet a stranger. I love my Mom and she loves me too. We are special together! I hope you liked my story.